Let’s learn how to create menu for a cocos2d game and how to move between a menu, the game scene, a level complete scene etc. Eventually your game will grow and you will have to create a clear structure to keep everything organized. As you can see, as with any app, the AppDelegate is the first object called. As such, it is the entry point to your game and will call the very first scene of your game. This means the first scene should probably the main menu which welcomes the user to the game and presents him with options. When a cocos2d game is created, a Singleton instance of the GameDirector is instantiated and charged with managing scenes. After all, your Main Menu scene is just another scene/layer called by the game director. Thus it is quite common to create another Singleton class used to tell the director which scene to call. Let’s call it the GameManager and his sole job is to tell the director which scene to call. Before we take a look at some code, keep in mind a game may grow to have quite a few scenes and while text is more human readable, it is easier to manage variables as numbers. The main reason is that switch statements use numbers, not text. Now this simple switch can be used to change scenes. All you have to do at the end of the AppDelegate is call GameManager’s sceneToRun method and pass it the MainMenuScene. At the Main Menu scene, depending on the level selected from the menu you can pass a particular scene constant to GameManager in order to determine the level scene to call. 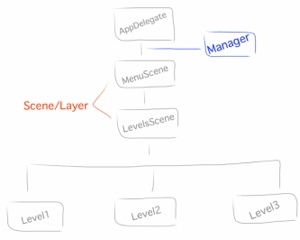 From within your game level layer, after defining if your player won or lost, you can call GameManager to run a custom EndOfLevel scene/layer. Then from that transitional scene you can call the MainMenuScene again. Just out of personal experience based on a book I read about learning cocos2d from RW.